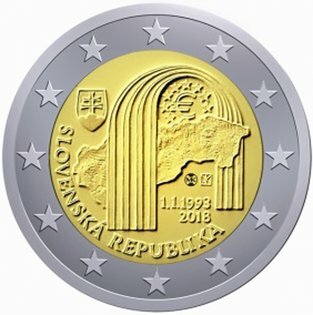 Description of the design : The design symbolises Slovakia’s entry into the European Union and the euro area by showing a stylised portal arching over both a map of Slovakia and a euro symbol surrounded by the European Union stars, some covered by the map. The Slovak coat of arms appears on the left of the design. At the lower left side, in semi-circle is the name of the issuing country ‘SLOVENSKÁ REPUBLIKA’. The date of the country’s establishment ‘1.1.1993’ and the year of issuance ‘2018’ appear, one above the other, below the right side of the map. Between the map and the date are the mint mark of the Kremnica Mint (Mincovňa Kremnica), consisting of the initials ‘MK’ placed between two dies, and the stylised letters ‘PK’, the initials of the designer, Pavel Károly.